"He is strange because he is free, sublime because his tree is rooted in the night and his leaves are stars (the practical unreal), graceful because he is no different from the space around him (movement is how his space dreams of home)." "Daniel Alexander Jones has touched me deeply as an artist and as a teacher. His imprint is on me forever." "Here is an artist that splits the planet apart to eat from its innocent heart. Here is a teacher that urges us first to defy, then to define. Here is Daniel Alexander Jones." "Daniel Alexander Jones forces us to confront histories that have been erased/silenced - telling the stories so many others are too scared to tell, reminding us that in these times, we can not afford to be afraid." "Daniel breathes commitment and personifies beauty; he practices rigor and creates great art. In short, Daniel Alexander Jones is a shaman--with a deep connection to the ancient mysteries of this world." "Daniel's work encompasses a rare blend of depth and detail with an eye for broad, wide landscapes – terrain that rattles our experience of the political, interrupts our tendency toward cynicism, and develops our ideas of what it means to be human. 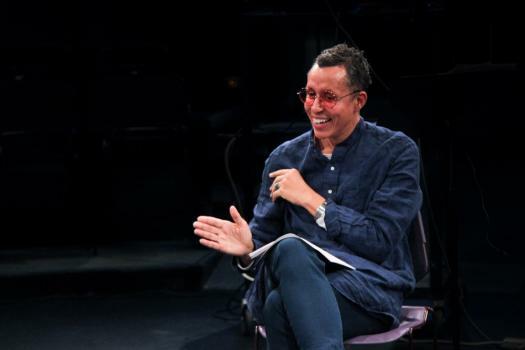 If the American theater had more artists working the way Daniel does, we would enjoy a transforming and generative world of performance and writing that is both stunningly beautiful and fundamentally necessary." "The words in Daniel's plays have wings and take flight like notes wailing out of the mouth of an alto saxophone... it's all in the jazz." On Phoenix Fabrik: "The language in the play, the 'ring,' creates an incantation, a vision that is entirely original and of its own making. The play calls up its own language to sing by. And its a hard, brutal and beautiful song." "Daniel Alexander Jones is one of those rare artists who isn't afraid to be smart; who brings his insights to his artistry; who exudes hope instead of cynicism; who galvanizes an audience with his charisma and his care; who can make magic in a classroom as well as on stage; and whose presence in the world makes us all richer." "Daniel Alexander Jones brings thoughtfulness, humor, originality, compassion, and, most of all, a unique touch of grace to everything he does."